A waggleview® reveals the incredible bond between the human and animal connection. These special interviews remind us to mindfully live in the moment, as our pets do every single day. 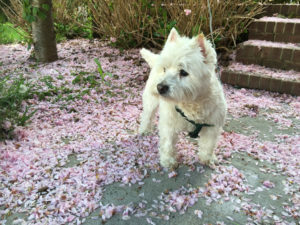 Read our featured waggleview® with Erin Hill, harpist and singer based out of NYC and Louisville KY, to find out how her dog inspires her and how he has changed her life. The Dog Owner: Erin Hill is a harpist & singer based out of NYC and Louisville, KY. She’s had a #1 album on the Billboard world chart and has played & sung with Cyndi Lauper, Kanye West, Enya, moby, Sinead O’Connor, a-ha, Jewel, and for two First Ladies. She’s played solo at The Royal Albert Hall, Carnegie Hall, and is also known as The Pretty White Girl from Comedy Central’s Chappelle’s Show. She was featured in an HBO Game of Thrones promo, playing the show’s theme on her harp, and on Bravo’s Million Dollar Listing. The Los Angeles label Cleopatra Records recently released Erin’s album Harp Town, which features Erin singing and playing songs from The Beatles and Sinatra to Adele, Smashing Pumpkins, Kate Bush, Alicia Keys, Rihanna, Radiohead, and U2. Cleopatra also released Erin’s holiday album Christmas Harp. I’ve always loved dogs, ever since I was little and we had a collie named Ernie (after Ernie Banks, “Mr. Cub” – yep, we’re huge Chicago Cubs fans). My whole life, I would always stop and meet dogs on the street, all sorts of dogs. 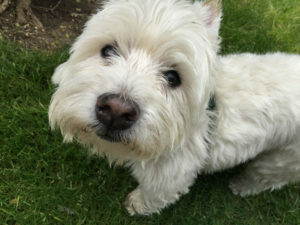 But then when I was in college, that’s when I glimpsed my first westie – it was love at first sight. I saw a little white dog walking towards me down the street, and I said to myself “That is the cutest dog I have ever seen in my life! 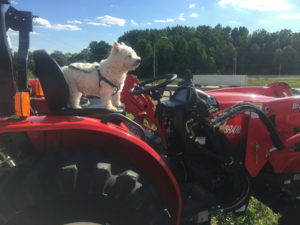 Hands down!” I talked to the owner and found out what kind of dog it was – a westie! I never forgot it. Later, when it was time to get my own dog, I remembered that dog of my dreams. 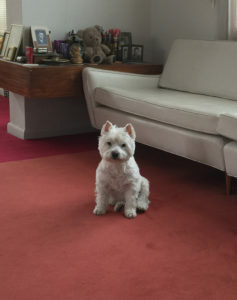 Just to be realistic, though, I first talked to my friends Becky & Dylan, who had a westie named Daisy. They gave her a rave review, and that sealed the deal. 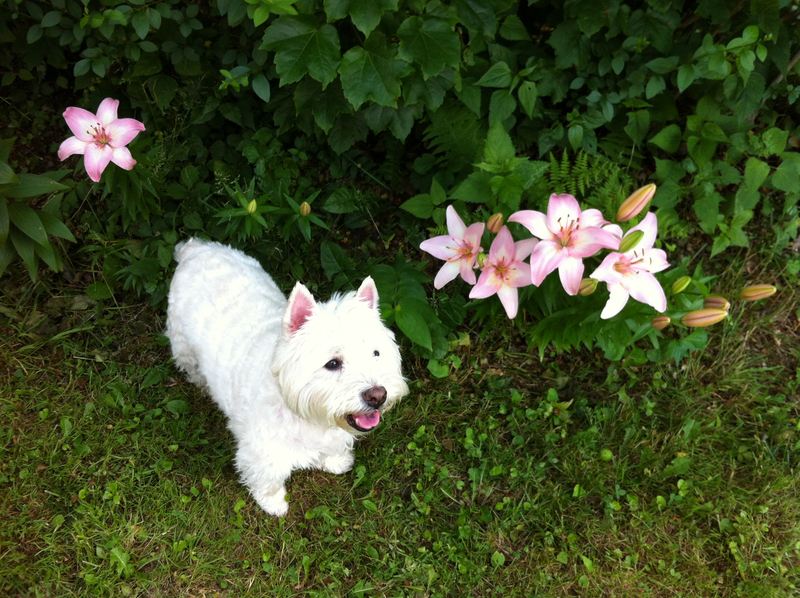 I found a breeder on Long Island, and we went and looked at MacLeod and his two sisters. It was a tough choice, and I had already picked out a name for a girl (Janeway – from Star Trek! ), but MacLeod really picked us, so that was that. His name comes from Highlander – MacLeod of the Clan MacLeod – there can be only one! Oh yes, of course, I talk to him all the time. Thing is, he’s really smart, so he understands an incredible amount of English. Thank goodness it’s been proven how much language dogs can understand, so you know I’m not exaggerating. I, of course, ask him a lot of questions like, “Do you want to go with me to check the mailbox?” or “Would you like to go for a ride in the car?” or “How’s about a slice of apple?” to which the answer is always a resounding “Yes!” (i.e. furious tail-wagging, wiggling and a big smile). But I talk to him about everything. And I ask him what he’s thinking about, how he’s feeling, what his opinion on such-and-such is. And I tell him everything that’s going on with me. And of course I often have to explain why he can’t have a second supper. Here’s his latest appearance in my music video. 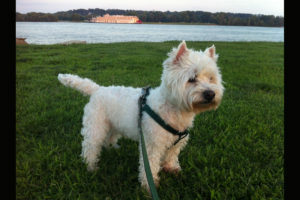 MacLeod the westie by the Ohio River, with the Belle of Louisville in the background. 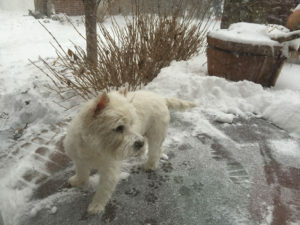 MacLeod is a star of the music video “Stay” by Erin Hill, harpist & singer. I used to think I would only want to have my own biological child, and I wouldn’t want to adopt. But I couldn’t possibly love MacLeod more if he actually came out of my body, so he’s taught me that if I can love him this much, then it doesn’t really matter whether I’m biologically related or not to a child, it’s just the ultimate love, no matter the genetics. Anywhere in the car! And once you’re out of the car, it’s going back to his house in Kentuckiana, where I grew up. We have a forest there, and he loves his big house and garden and woods. Especially since he’s in a little apartment in NYC most of the time. He is great on a long car ride – it’s 12 hours or so to Louisville, and he is in heaven the whole way. He loves a party – the more the merrier! He loves when we have music video shoot and the place is full of people. He would like to have a full house every day. Not pick up their poop! This is probably everyone’s answer, right? How is it possible you could own a dog, and then let them poop everywhere and just walk on, just leave it? I always think – you know, their dog is in just as much danger of stepping back into their own poop on their next walk as MacLeod is. Don’t they care if their own dog steps in poop? I actually saw this happen outside my building: a man’s big dog left a huge poop in the middle of the sidewalk. The man started to walk away and an old lady called out to him, “Hey, aren’t you going to pick that up” And he screamed back at her “YOU pick it up!” and walked on. Can you believe that? I worry about that poor dog, having an owner like that. Well, while we’re on the subject — picking up his poop, for one! And then, making sure I spend enough time with Cloudy and give him a good life, and give him interesting things every day. It means, when I go out, whenever possible, taking him with me. A little thing, like riding in the car on the way to pick something up at the store, to me, it’s a little thing, but to him – it’s huge! The more things I can involve him in, the better his life is. Well, he used to dress up every year at Halloween – one year he was Superman, and another year he was a pink bunny! (Bunny is one of his nicknames). But now he’s just turned 16 years old, and he’s a bit of a grumpy old man, so he has no time for silly things like clothes. He will barely even consent to putting on a coat in the winter. I cannot imagine life without MacLeod. He’s the love of my life. When he’s at the groomer’s and not in the house, it’s like I’m in a parallel universe where things are not right. I don’t have a human baby – so he is my baby. 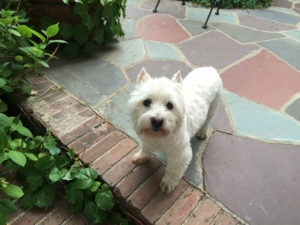 MacLeod the westie in Kentuckiana looking out the bedroom window. 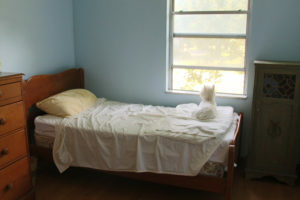 MacLeod is a star of the music video “Stay” by Erin Hill, harpist & singer. 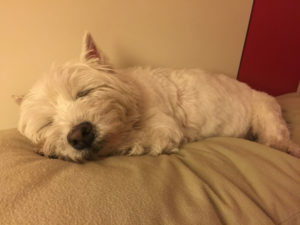 Q: I love my dog because he is my baby. He is also the cutest, most beautiful thing in the world – I can hardly even believe how perfect he is. He’s also super stubborn and full of personality and his own ideas. But I wouldn’t want him any other way, because that’s what makes him who he is. We don’t make dog treats, but we make his supper from scratch – we cook organic, steel-cut oats and mix in organic ground turkey and chopped mixed vegetables (equal parts of each of those three things), and that’s what he eats. Then he get fish oil, vitamins, and Royal Canin dog treats. 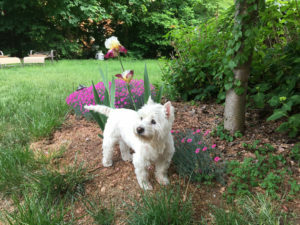 Thank you Erin for taking the time to participate in the Waggleview®.